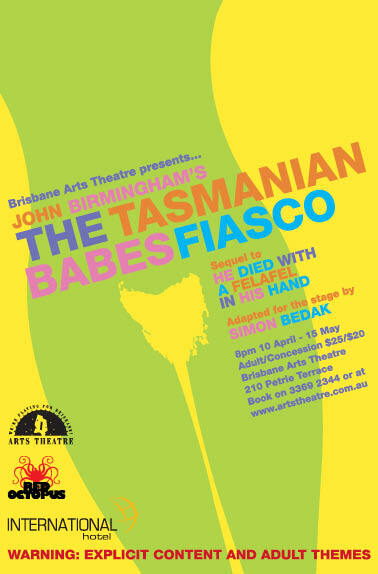 We've arrived at the final week of The Tasmanian Babes Fiasco. We've had a great run, with good-sized and appreciative audiences. But we've got four shows left, and you know what? I'm ambitious. I'd like to sell out those four shows. I'd like my cast and crew to have the joy of performing in front of packed houses for their last four outings as these amazing, funny, crazy characters. I'd like to be able to stand at the back of the theatre, peeking through the curtain that leads into the stalls, and see rows and rows of heads thrown back in the throes of gut-laughter. I'd like to be able to show John Birmingham and Simon Bedak how much we were able to rock their work. 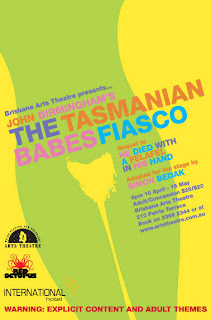 For those of you who have seen the show, or are coming along this week - thank you. Thank you a hundred times over. Your support has meant the world to me. This show is the result of a monumental effort from many, and your attendance and enthusiasm is a blessing upon that work. To entertain you and make you laugh is the best reward we could get - but of course, by buying a ticket you have helped support a local theatre that is working hard to survive and flourish. This is a unique production. It's unlike anything else you'll see on the boards. It's a guaranteed laugh - you have to be made of stone to not giggle and guffaw your way through this show. It's local - Brisbane is its heart and soul. And it's relatively cheap - at $25 a ticket for adults, or $20 for concessions. If you read my blog and get any kind of enjoyment from it - if my silly tales of life as an improvising actor-type, a clumsy journalist and a wannabe writer ever raise a smile or provide an amusing distraction - then I implore you to come along to one of our final four shows this week - Wednesday 12th , Thursday 13th, Friday 14th or Saturday 15th May (our epic closing night). I love writing this blog. I love that people read it. I love that I now know many of you in real life because of this blog. I love the idea that there might be reading this who never comment or never tell me they read it - they just cruise over and have a look. I'll always pimp my shows on this blog - although I do hope to increase and vary the content after Tassie Babes finishes (exhaustion does somewhat hamper output!). But nothing I pimp will ever be quite like Tassie Babes. It's my favourite book, that I've been able to bring to the stage. I'm so, SO proud of it. And I want to show it off. Please consider - and please book. Like Barnes, if I could, I would. But that is the only thing he and I have in common. In all honesty, he frightens me.